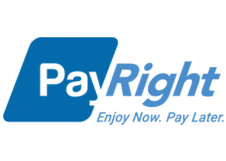 PayRight is a responsible lender that offers interest-free payment plans to consumers. Your choice of product and process allow for a tailored solution. Product and processes are simple & secure and all risk is absorbed by PayRight whether you choose the Buy Now, Pay Later option and settle the plan instantly or prefer an instalment based arrangement.